Imagine the Big Bang in your mind. You’re picturing galaxies hurtling past in all directions, like so much star shrapnel from a celestial pinata. I stole this cool expanding toy from my son. It’ll help me explain what’s going on. Here it is, closed up. That’s the singularity. And then, Big Bang, and the Universe expanded, getting bigger and bigger until it reached its current size which is not to scale. We know there are galaxies are pulling at each other with their mutual gravity, theoretically slowing each other down. Here’s a big question. Will the expansion go on forever? Will it keep coasting, and never quite come to a stop? Will it expand and come to a stop over the course of infinite time? Or will the mutual gravity of all these galaxies eventually overcome the momentum and pull everything back in again. Will the Big Bang go in reverse, eventually smashing the entire Universe into a singularity again – the Big Crunch. And maybe this leads to another Big Bang, and then another Big Crunch, and so on and so on. Is this how the Universe ends, and then begins again, and then probably ends again? And you could build a forward only time machine that keeps looping into a totally new but identical universe over and over? Before I get onto the question, I need to remind you that is a bad model. The Big Bang didn’t happen there, in the middle. It falls apart with the actual topography of the Universe. There’s no center. The Big Bang happened everywhere. Go watch that video and then come back and laugh mockingly at this hilarious oversimplification of the topology of the cosmos. Actually, just stay here we’ll link this at the end so you can go watch it then. Will the Big Bang go in reverse? Astronomers have asked themselves this exact question, and we’ll never know. Ever. Not because they can’t figure it out, it’s because they won’t tell us. They’ve totally got sensitive enough instruments answer it. Actually, that’s not true. They won’t shut up about it. As a result, I can say with 100% certainty that the Universe is expanding, no question. We can see galaxies speeding away from us in all directions. So if it is going to crunch back down, it’s got to stop expanding first. So, how fast is that going on? Astronomers refer to this as the Hubble Constant. This is the amount that space is expanding. The best estimate is that, on average, galaxies are moving away from each other at about 70 km/sec/megaparsec. In other words, if you take a megaparsec of space – a cube which is about 3.2 million light-years across. Slightly bigger than the distance to the Andromeda galaxy, which has nothing to do with Kessel runs. For every second that goes by, that cube gets about 70 km bigger. A galaxy that’s 3.2 million light-years away is now 70 km further, and now it’s 70 km even further. Was this faster in the past? Will it be slower in the future? Can we calculate these different numbers and figure out what the future holds? The speed of expansion depends on the momentum from the Big Bang, counteracted by mutual gravity from all galaxies. If the pull is strong enough, momentum will be overcome and pull the galaxies back together. That’s the Big Crunch. If the pull is too weak, then the expansion runs forever. How did they figure out the answer? They measured the density of the Universe using NASA’s Microwave Anisotropy Probe. Too dense, crunch. Not dense enough, eternal expansion. Apparently, the Universe is exactly dense enough that it will keep on expanding forever, and finally coast to a stop in an infinite amount of time. This rules out the Big Crunch. But that’s just the density alone. Our Universe is far stranger than astronomers ever imagined. Instead of gradually slowing down, like a driverless shopping cart at Costco, the expansion of the Universe is accelerating. Thanks to our new mysterious and freaky friend, dark energy, discovered in 1998. Astronomers observed distant supernovae billions of light-years away to get a sense of how the Universe was expanding in the past. Instead of finding a result that matched one of the three theories I mentioned earlier: expanding forever, coasting to a halt, or eventually reversing direction, they did a whole bunch of really complicated math and research and discovered something completely bizarre. Galaxies are moving faster away from each other now than they did in the past. Some mysterious force is accelerating the expansion of space. Wouldn’t it be cool if the Universe went through cycles, with Big Bang, then Big Crunch, and so on? Currently, nature doesn’t care what we think would be cool. Instead, the expansion of the Universe is accelerating. It’ll never stop, and it’ll never run the Big Bang in reverse. Until nature starts caring, we’ll have to stick with Steam sales. What aspect of cosmology and the Big Bang do you find most interesting. Tell us in the comments below. Will the Big Bang go in reverse? Nope. No Big Crunch. Will the Universe go on expanding forever and become an infinitely large, and an infinitely dilute Universe? Nope. Not that either. Oddly, the Universe is steady state. Einstein tried to address this problem in early General Relativity. He realized that the Universe could not be static. Gravity would eventually cause it to collapse. So he added the cosmological constant to get around that problem. But that model did not work either. The equilibrium he intended was not stable. Eventually, the Universe would either expand or contract, irreversibly. scripturalphysics.org/4v4a/BeyondEinstein.html which gives a link to the .pdf file. This article has not been reviewed and so I am very interested in readers’ opinions about it. It’s really sad that people find it necessary to dilute science by filtering it through an irrational belief system of ancient myths and superstition. This goes against everything science stands for, which is the obliteration of myths and superstition in favor of facts and reality. One may only surmise that you saw the word “scriptural” in the address and panicked assumed it would be full of Biblical/Quranical/Et Ceteral references? I can assure you, having read through it myself: there are none such in the paper. IOW, in the future? You might want to read the paper BEFORE commenting on it next time, m’kay? I mean, to be fair, it isn’t that great, but dude (dudette? ): you just totally flew off the handle for no observable reason. To sum up: faulty physics, oh yes, quite; religiously muddled faulty physics, not so much; response, totally inaprop. Might want to get that hair-trigger nerve checked…. Time matters for living beings, only. From what I read of his paper, seemingly the only thing Brian understands with clarity is that there is a difference between the understood “locality” under which General Relativity was first conceived, and the “non-locality” clearly inherent in quantum mechanics. Unfortunately, I don’t see an easy way of resolving his confusion on just about every other issue, other than to offer a link of my own: http://arxiv.org/abs/1408.1826. In short, in Dr. Maudlin’s view, the EPR experiment did not show what many people think it did, and Bell (as a result) did not prove what most people think he proved. The implications of Bell’s actual proof are fundamental specifically to understanding how GR and QM describe (and are capable of describing) our universe. It also tends to imply that — at least until we abandon these theories for something better — all physics may actually be non-local, despite still possibly being deterministic in nature. the problem I have with all these “final facts”: they change faster than anyone can follow. Picture yourself 4000 years ago amongst the builders of Stonehenge: “of course we know how the skies work!” Then the Egyptians… they were pretty sure how and why the heavens work. And now the “modern” astronomy: we are pretty sure we know how the machine works, but…. why do I have my doubts? A new telescope, like Hubble… Gaia…Webb and it is “Oh, we didn’t know that before… that’s a game changer!” (Didn’t we heart that before?) So all we know is … temporarily! The neatest theory of recent-ish times was the steady-state model. This extended the idea that we are not in any special part of the Universe to the time axis. Stuff was continuously popping into existence. Neat and tidy. Fred Hoyle coined the term ‘Big Bang’ as a term of ridicule. But, the data that emerged from deep space views and the cosmic background seemed to point to a big bang. The next neatest idea was that everything went back to a point. You have small sets of ‘virtual’ particles continually popping into and out of existence, which can give measurable things like the Casmir effect. The Universe would be a big one of those, recycling itself. It did not have to use an infinite amount of space and time. But, if you look at the expansion of the universe, it didn’t fit. Okay, so the universe is probably going to expand outwards forever, or until some presently unobservable phenomenon starts to take effect. The next neatest solution is for it to exactly sit on the boundary so it just does not come back on itself. This was almost true: the expansion of the universe was pretty close to the critical boundary, but these days most figures put is safely on the expanding forever side. But why is it expanding forever? Do other Universes do something different? There are other theories, such as the ‘Big Rip’ which suggest the universe expansion rate will increase exponentially. This may be possible but it is a large extrapolation on a small discrepancy, and I don’t buy it just yet. So, that leaves us with the Universe expanding forever, and taking up infinite space and time, but life only existing for a tiny bit of it. I know it is irrational, but that seems somehow messy and wasteful, even though nothing is actually getting wasted. “The expansion of the Universe is accelerating. It’ll never stop, and it’ll never run the Big Bang in reverse. ” You know Cain, the above statement you made is rather fatuous. Even Einstein made assumptions that he had to recant and regretted later. The Big Bang happened, but just because we can’t understand how it happened and what preceded the big bang event, we should never assume it might not happen again. Looking infinitely forward and backward in time, nothing makes sense except for infinitely repeating big bang/ big crunch cycles. To support this idea and simultaneously throw a bit of cold water on the forever expanding universe idea, you need not look any further than the evidence of “The Great Attractor”, whereby entire galaxies and superclusters are all spiraling toward something with very strong pull. Will the great attractor one day stop pulling all these galaxies together, and allow them to start drifting apart? Not very likely if I may be so bold to say so. Maybe both concepts are working together whereby those galaxies speeding away are actually speeding toward the great attractor’s backside, following the curved space “walls” at the outermost limits of the universe. In my paper (BeyondEinstein.pdf), I did not specifically address the expansion/contraction issue because the scientific community seems to be unsettled about this question. It seems to have neither a settled conception nor misconception. It is an “open question”, and is not being ignored, and so I left it at that. However, readers will not understand what I say below unless they have read my paper (which they probably don’t understand anyway if the comments here, or lack of them, are any indication). What seems to be clear at this point is that we do not live in a matter/antimater Universe. As stated in BeyondEinstein.pdf, we live in a local/non-local Universe. That is, the Universe is divided into two realms of behaviors: one based on space/time relations and the other based on time/space relations. Each would appear to be statistically identical to the other to an observer within each system; there is no way to tell “which is really which”–space/time or time/space. To us, they are co-mingled: we see the local realm as populated by discrete stars and galaxies localized in space. We see the non-local realm as NOT localized in space: as a diffuse microwave background, as diffuse X-ray background, as diffuse gamma ray background, and as a diffuse particle background (cosmic rays). The boundary between the two behaviors is defined by the speed of light. Below the speed of light (space/time), the behavior is local and expanding in space; above the speed of light (time/space) the behavior is non-local and expanding in time ( which looks like space from within that system). At the speed of light itself, it is neither expanding nor contracting. The progression of time cancels out the progression of space and vice versa. The numerators and denominators of the ratio (speed c) are continually changing, but the ratio itself is constant and unchanging. That means that the “cosmological structure” is doing nothing; it is “stationary” in time and space, and it is doing it at the speed of light! Anyway, the dynamics point to a static universe. A trillion years from now there will still be planets, stars, galaxies, pulsars, quasars, etc. AND the Universe (as we see it from our perspective) will still be expanding, yet the density will still be the same. Statistically, it will look like the one we see now. Hoyle was probably right. But rather than his “continuous creation” of new matter, the existing matter in the local and non-local portions may be tossed back and forth. The non-local matter could localize into our system of reference (and vice versa). But to do so, it would have to exceed the speed of light in all three “motional dimensions”. That would require an EXTREMELY energetic process. The only candidates for this seems to be the quasars. If so, they are on their way to the non-local realm. (Presumably, the non-local realm (time/space) has identical processes that send matter back into our local realm). And so we have an extremely dynamic Universe which remains static! “What we know as the universe could actually be just one of a pair that exists in the same space but at different times.” (Science News, July 25, 2015, p. 17 “Times Arrow”. Come on, can we rephrase this question less like a ten year old would? There is obviously a lot going into these theories and the reader base of UT is probably a bit older than high school age. So do you think we could shift the language to reflect the fact that we are all adults Mr Cain? Maybe instead of asking in a child like way, “will the big bang go backwards”? maybe it could be something like “The Big Crunch Theory: discussing the potential collapse of the universe” or anything that would indicate you are talking to someone above high school age. I disagree. The tone of UT is part of what attracts new readers. If you don’t like it, read something else or start your own. The tone has changed. I’ve been a reader for over 5 years. Big crunch will happen only if Big Bang is pushing space & time, just like an expanding balloon. At one point it may pop doing a Super Bang (or may be a Super Bang has happened already !!!) otherwise it could do a Big Crunch. 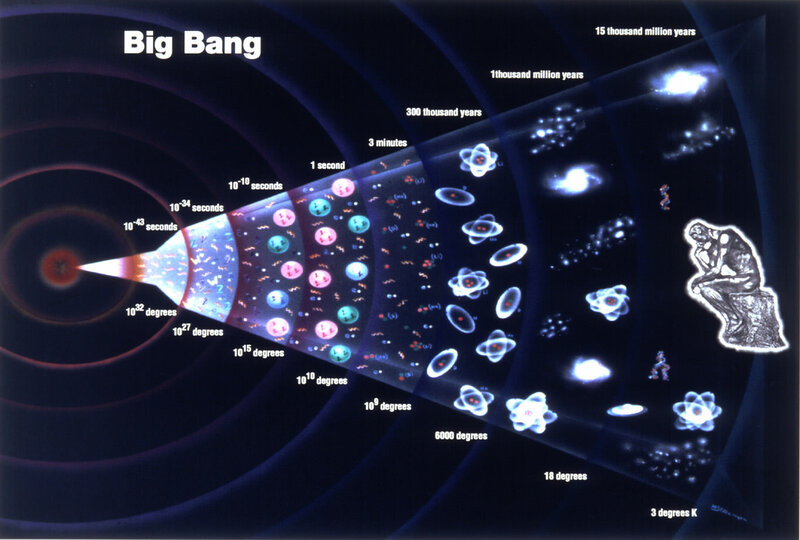 On a calmer ground, Big Bang is probably not pushing space & time, hence no Super Bang & no Big Crunch.